Very few things can compare to riding the open road on a motorcycle. The feel of the bike under your control. The sound of the tires against the pavement. The feel of the wind in your face. Can’t wait to get going? Here's how to get a motorcycle license. Each state has its own requirements for getting a motorcycle license. You’ll need this certification before you can drive your bike on public roadways. Be sure to check your state’s licensing requirements. In general, most states break down their motorcycle certifications into two categories: motorcycle permits and motorcycle endorsements. Just as you have to get a permit before you earn your regular driver’s license, getting a motorcycle permit is a step you must go through in getting your motorcycle license. A permit is usually valid for one year and places restrictions on what you can and cannot do. For example, those with a learner’s permit usually can’t carry a passenger on the bike. Many states prohibit those with learner’s permits from driving after dark. You’ll need to check with your state's Department of Motor Vehicles (DMV) to find out about learner’s permit requirements in your state. In general, it’s a fairly simple process. Get a copy of your state’s Motorcycle Operator’s Manual from your DMV. You can get online copies on most state DMV websites or get a hard copy from your local DMV or Highway Patrol office. Study this manual! You’ll have to take and pass a motorcycle license written test and this is not an easy exam to pass. There are practice tests available online; use them! Understand that some states may require supervision by a licensed motorcyclist over the age of 21 while you’re operating on a learner’s permit. Again, the requirements for getting a motorcycle endorsement on your driver’s license may vary between states. Check with the DMV in your state to find out what’s required for you. An endorsement is like an add-on to your regular driver’s license. It means you can carry a passenger on your bike and you can drive after dark. In most states, you have two options for getting a motorcycle endorsement. Once you have this, you’re on your way to hitting the open road. You can take a road test. This works the same way as your driving test for your regular license. You’ll need to demonstrate that you have the skills to handle your bike under different road conditions and in different situations. Some of the skills you’ll need to be ready to demonstrate include simple maneuvers such as starting, stopping and turning. You'll need to show confidence in your more complex skills like S-turns, U-turns, sudden stops and sharp or unexpected turns. Motorcycle rider safety course. Many states will let you bypass the road test if you show them proof that you’ve successfully completed an approved motorcycle rider safety course. 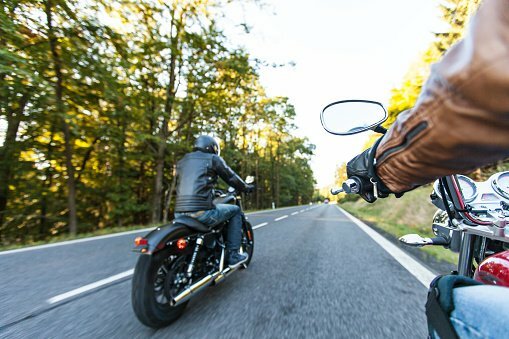 Once you’ve met your state’s requirements for getting a motorcycle license, the motorcycle endorsement becomes an add-on to your regular driver’s license.